Tales of Mommyhood: How Many Strollers Is Too Many? How Many Strollers Is Too Many? When my oldest was born, we were kind of overwhelmed when we went to look at baby strollers. We ended up purchasing a stroller/travel system. It was a larger stroller with one handed fold, a storage basket underneath, cup holders for him AND the person pushing the stroller; it had a 5 point harness and came with a car seat that would attach as well. It served me well until he was around a year old, and then I found it too large for a quick trip to the mall. I bought a small umbrella stroller, and used that the odd time I needed it until he was around 2, when we stopped using it altogether. 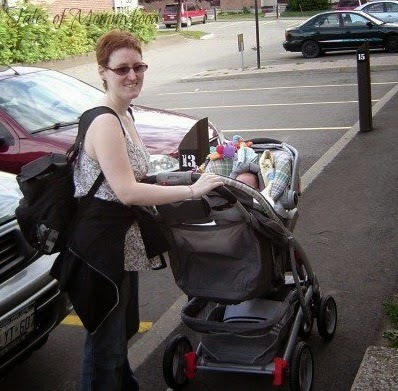 When Mr. K was born, I still had the same travel system and it came in handy - I used a baby carrier more often when we went out when he was an infant, and as he got older I found the stroller to clunky. It took up so much room in the back of the jeep, that I had trouble loading my weekly groceries around it. I didn't like the umbrella stroller because there really was no support, so I found a stroller that was just a bit bigger than an umbrella stroller, but was super sturdy. I read somewhere that the average family will go through FIVE strollers when their kids are young, and thought it was crazy, but then realized that I used 3 (and while we were at Disney World when Mr. K was an infant, we rented a jogging stroller and I was in love with it - if they hadn't been so expensive, I would have bought one when we got home). Did you use a stroller for your kids? How many did you have? 16 yrs ago, when my boy was born, we had a travel system as well. He outgrew the car seat way too early as he was a big boy. I loved the stroller tho, the size, color, very awesome. But we needed something that was more durable in the snow so we got another stroller with massive wheels. No umbrella strollers for him because his shoulders were to wide, it wasn't comfortable, and the height was awful for hubby. When I was pregnant with our baby girl, who is now two, we got a Bugaboo. Best move ever. The bassinet part was also used as her first bed, at home and while visiting. She's getting big for the actual stroller part, but it still serves it's purpose, and we can also use our buggy board which is fun for her too. I'm hoping I can get one more winter out of it. The foot muff is just soooo great for the wild winters here. And once we are done, I can always sell it and get some of the small fortune back. If I thought we would have had a 3rd, I would have invested in a high end stroller when we got back from Disney. I was fairly certain Mr. K was our last though, and it seemed like a waste when there really wasn't anything wrong with what we had. Thanks for stopping by!